What makes a successful Ninja Warrior? Why are climbers and parkour athletes so successful in the Ninja Warrior competitions? What skills and which muscles did they properly train? 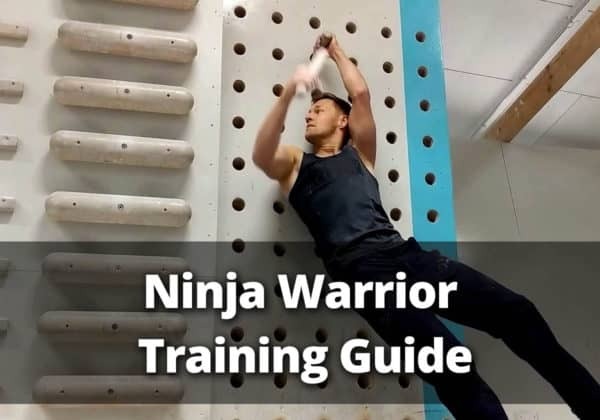 All of this I’m going to show you in the following Ninja Warrior training guide, so that you will become a successful Ninja Warrior and can compete with all the Ninja Warriors out there. Ninja Warriors need first and foremost a lot of upper body strength and endurance, explosiveness, and great grip strength. As an optimal weight-to-strength ratio is also essential, it doesn’t make sense just heading to the gym, lifting some weights, and becoming bulky. Advanced climbers and parkours athletes have naturally trained most of these disciplines and thus are performing so well in the Ninja Warriors seasons. That’s why I strongly recommend bouldering. But, let’s dive a bit deeper into the single training aspects. You need to become good at swinging like a monkey. If you are not used to such a movement pattern, this might need you to train it on specific brachiate obstacles. You will get a feeling for how to generate momentum with your own body weight and swing further and higher with less effort. Ninja Warrior and parkour gym are likely to have such obstacles. Some bouldering and climbing gyms have them as well, nowadays. So check them out and get used to swinging. You should be able to hold your overall weight with one hand, as “monkey swinging” and hanging will become an essential skill. Buy some grip strength trainers, a hangboard, and a pull-up bar with various holds, or gymnastic rings, boulder 2 two 3 times a week, and use a towel for doing pull-ups. Use the grip strength trainers multiple times a week, if not daily. You can use them when sitting at your computer, watching TV, or reading some stuff. Cycle between different strength trainers to get the optimum out this training. Now to the hangboard: You will love it! 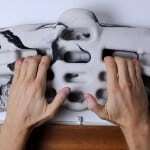 It will give you a major boost in grip strength, even though you may already be bouldering several times a week. Explosive upper body strength is what most people in the gym are missing, as they typically perform weight lifting exercises in a slow and controlled way. Unfortunately, it’s crucial for some of the Ninja Warrior obstacles. The salmon ladder is probably the best-known example. So, add explosive movements on the pull-up bar and workouts on a campus board to your training regime. Start with laddering, meaning climbing up the rungs in the simplest way. Once you are comfortable with that, you can try dynamic movements, and “jump” from one rung to another with both hands at the same time. This will bring you a lot of explosiveness. If that’s too easy, take two or even three rungs at once. You can find campus boards in almost any bouldering gym. Always try maintaining muscular balance to avoid serious health issues. Train your chest and shoulders as well. When climbing or bouldering a lot, it’s important to add some rotator cuff exercises to your weekly workout. Well trained core muscles will give you balance and stability, reduce the risk of injury, and ease a lot of Ninja Warrior obstacles. Bouldering will also improve your core strength. In addition to bouldering, you should do a lot of core exercises on the pull-up bar and the gymnastic rings. That way, you can train your upper body at the same time. Most preliminaries and often the first two stages of the Ninja Warrior competition feature at least one obstacle which requires a great balance and precise foot placements. Training your footwork, coordination, and balance is, therefore, a vital part of a Ninja Warror training. Balance boards, bosu balls, slackline training, and precision jumps would be the way to go. Often, bouldering and climbing gyms have slacklines. If you are a member of such a gym, use them while resting between your climbs. I also recommend taking some parkour classes. Parkour teaches you how to get over and through obstacles in a smooth and effortless way. Precision jumps and balance are some of the major elements of this sport. Well, practice makes perfect. Either you have access to Ninja Warrior obstacles in your bouldering or Ninja Warrior gym, or you can build some of these on your own. Finding blueprints online is nowadays really easy. Pinterest is a good place to look them up. Don’t forget to train on trampolines as well. There are some obstacles in the Ninja Warrior course that require you to use a trampoline. The jumping spider and the salmon ladder are often prominent examples. Even if using such a trampoline sounds simple, candidates screw them up all the time. Make sure, that you won’t be on that list! Also, have a look at the Ninja Warrior Gyms directory to see if a suitable training facility is nearby. I have currently listed gyms in Australia, Canada, Germany, France, Netherlands, Portugal, Spain, Sweden, and the United Kingdom and will add gyms in the United States little by little. In case you struggle with slipping on obstacles, such as the Spider Wall or the Hanging Doors, then you are certainly wearing the wrong shoes and my article about the best Ninja Warrior shoes can be of help. A lot of the previously discussed aspects can be trained by going to a bouldering gym on a regular basis. So, if you aren’t already a member of a bouldering gym, become one! You will see great gains when training there. Bouldering is by far the best cross training for most of the Ninja Warrior obstacles. Not only does it improve your upper body and core strength, the various holds will enhance your grip. And you will learn how to solve problems with limited stamina. If you are already well-trained and have access to a Ninja Warrior gym, it’s even better than a bouldering gym, but not necessary. I recommend a Ninja Warrior gym at least for practising the obstacles and training your muscle memory. Be prepared to train 5-6 times a week, but do not overtrain. Keep at least 1 day per week for rest. Don’t risk injuries like muscle tears and tendon inflammations due to overtraining. You surely don’t want to have setbacks in your training like this. Set yourself small and incremental goals. This way you will stay motivated and have lots of successes to celebrate. Before each workout, warm up and stretch your whole body, but especially the upper part to minimize the risk for injury. Do this for at least 10 minutes. Use foam rolling and deep tissue massage for further enhancing your flexibility and loosening tight muscles. The Rolflex PRO is one of the best tools for this, besides the Armaid. Check out my recommended Ninja Warrior equipment, if you want to know more about the tools I use. Eating right is as important as doing the right exercises. You want to build up muscles, but don’t build up fat. Getting lean and improving your strength-to-weight ratio must be your goal. Any fat you are carrying while hanging on some obstacles will deplete your stamina unnecessarily. The lighter you can get while building up muscles at the same time, the better your performance will be. For some, this means dieting while training. Make sure to digest plenty of protein for muscle development if that’s the case. This article was for giving you an overview of what it needs to focus on in your Ninja Warrior training. Follow these tips, and you will have a lot of fun mastering all the Ninja Warrior obstacles. I’m going to cover each of the training aspects separately in multiple posts. So, stay tuned, subscribe to my newsletter, and look forward to great details, insights, and training tips. I hope you enjoyed this guide. Let me know by sharing it or commenting below. That would be great!